For the photographer, see Charles Clyde Ebbets. 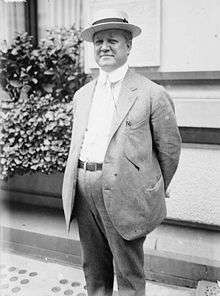 Charles Hercules Ebbets, Sr. (October 29, 1859–April 18, 1925) was an American sports executive who owned the Brooklyn Dodgers from 1902 to 1925. Ebbets was born in New York City and was a draftsman and architect who designed numerous New York City buildings, including the Metropolitan Hotel and Niblo's Garden. He served on the Brooklyn City Council for four years, and was a Democratic member of the New York State Assembly (Kings Co., 12th D.) in 1896. Ebbets started with the Dodgers as a bookkeeper in 1883 and became a shareholder in 1890. He took an active role in marketing baseball to families and took over the Dodgers' team operations in 1898. He also managed the Dodgers that year and the team finished tenth. Ned Hanlon, the owner and manager of the Baltimore Orioles, bought some of the remaining stock in the Dodgers after the 1898 season and took the best Baltimore players to the Brooklyn team. The Dodgers won pennants in both 1899 and 1900. In 1905, Hanlon wanted to move the team to Baltimore, but Ebbets bought out his shares. Ebbets is credited with inventing the concept of the rain check and of proposing a player draft favoring teams which finished low in the standings. He financed the building of Ebbets Field in 1912 by selling half his shares in the team to the McKeever Brothers. Ebbets died of heart failure at age 65 in New York City and is interred in Green-Wood Cemetery in Brooklyn. 1 2 3 "C.H. Ebbets Dies of Heart Disease - Confined to Room Since Return From Brooklyn Training Camp 2 Weeks Ago - Called Dean of Baseball - All National League Games Called Off for Tuesday, Day of Funeral". New York Times. April 19, 1925. p. 26. Retrieved 5 September 2016. Biographical Dictionary of American Sports, Greenwood Press (1987).